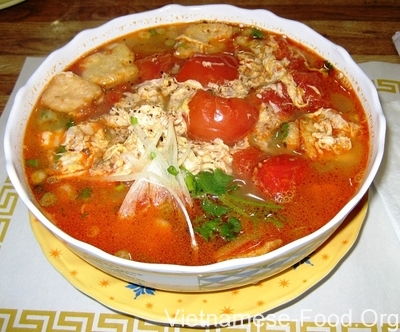 Crab noodle soup is a favorite dish of many people.I think you should refer to the instructions below of professional chef to cook a delicious dish for your family on the weekend. 500g field crab,150g tomatoes,30g red pepper,5 medium sized fried tofu, 2 kg rice vermicelli, spices, pepper, sugar, fine shrimp paste. 600g raw vegetables,300g shallots,50g Vietnamese fried shallots,50g powdered red pepper, 100g green onions. Crabs are cleaned,to reject plastron (under-shell of a crab),then to take crab-roe in the bowl. After that,to fry crab-roe with shallots. Crab bodies are put into the blender, add a little salt, then mix the crab was crushed with cold water,then to filter water,to reject the residue. - Add the filtering water on the stove, to boil untill crab-roes are resurfaced ,take out the bowl. -To fry tomatoes with shallots, stir briefly astronauts.Raw vegetables are washed with salt.Tofu is fried again. -Powdered red chili is mixed with water, sugar,oil cooking,pepper.Then put them into the pot to cook. tofu,crab-roe is fried,add a little salt or fish sauce. 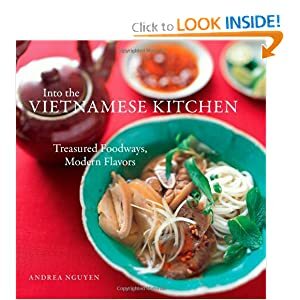 -Cook the rice vermicelli and set aside,add rice vermicelli with chopped green onion,Vietnamese fried shallots,tofu to bowl.Add the sauce to bowl.Served with tomatoes, fried peppers, shrimp paste (To depend on your taste).